Published March 22, 2013 by Imperial Beach Patch. A man who died when his trailer caught fire in the Imperial Beach Trailer Park​ in the early morning March 8 has been identified as Daniel Martin Drake, according to the County of San Diego Medical Examiner’s Office. 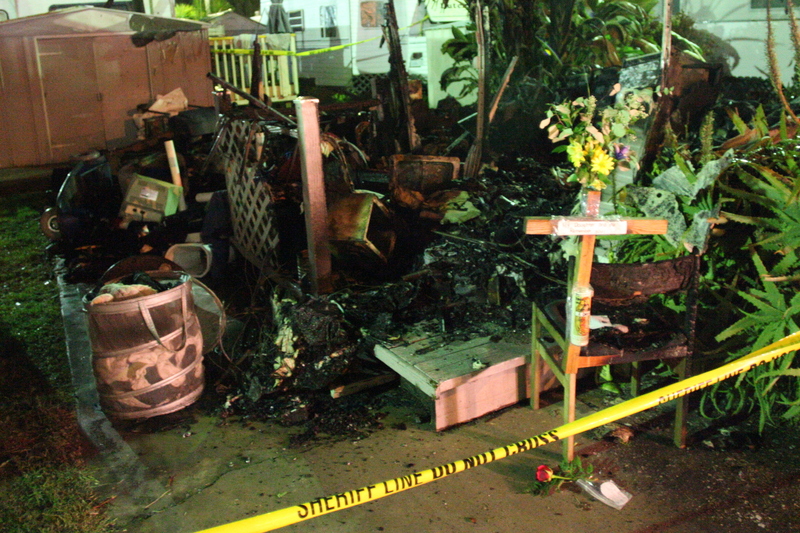 An investigation into the cause of the fire is ongoing, said Detective Anthony Portillo with the San Diego County Sheriff’s Department Bomb and Arson Unit. “It appears as though it was an accidental fire. We can’t really nail down the cause right now, but were still doing some testing,” he said. Family and friends remember the man who lived in Imperial Beach the past two decades as a hard worker, an avid fishermen and a good man. “It’s so weird. It’s still so surreal to me,” his oldest daughter Angela Bain-­Trujillo told IB Patch. Drake was born Dec. 23, 1950 in Lapeer, MI and moved to Southern California with his parents as a boy. He came to Imperial Beach in the 1990s to be closer to his mother and sister after a divorce, Bain-­Trujillo said. Drake worked in construction, as a carpenter and repaired tractor trailers traveling through Riverside, CA, she said. While visiting his trailer park after the fire, Drake’s family were told by his friend and neighbor Adolfo Franco that the two went skydiving six years ago. They jumped out of a plane together though Drake used a mobility scooter since his hip was injured in a car accident. “There was a lot of yelling, you know, and a lot of joking and such, but yeah, he did it,” Franco said. “Steven just started crying,” said Sal Trujillo, Drake’s son-­in-­law. Drake’s son Steven went skydiving around the same time but never thought to ask his dad because of his hip. Despite the handicap, Franco said Drake would go horseback riding and regularly make trips to the Imperial Beach Pier to fish. “Other than that, he was a happy­-go-­lucky guy. He loved playing dominoes and drinking beer,” Franco said. Eileen McGrath manages the trailer park and knew Drake for more than a decade. McGrath said Drake was known to be a happy, kind man who liked to tell stories and jokes. Drake loved pier fishing in IB or other parts of Southern California, Trujillo said. “When he was healthier he went a couple times a month. He didn’t fish as much at the end, but that’s where his oldest son [Daniel] got the fishing bug,” he said. Growing up her parents had five kids and little money, Bain­-Trujillo said, but they always managed to put food on the table. A fiddler who knew how to craft wood, Drake built rocking horses, benches and toy chests for his children growing up. “Back in the day he loved being on the CB radio cause he used to work at a trucking yard and work on the trucks and he would listen on the CB and talk to the truck drivers,” Trujillo said. “It was very tight back then for him work wise. He wasn’t making a whole lot of money, but I’ve been with his oldest daughter for 22 years now so I’ve seen all the kids grow up, and back then he was a hard worker,” he said. Sometimes he would ride his bike to work for truckers, but when he did have a car, he was the kind of person that would pick up hitchhikers or people who needed a ride, Bain-­Trujillo said. Like anyone else, Drake came with the good and the bad. Drake and his children didn’t always stay in touch, and he was known as a bit of drinker, Trujillo said. A few years ago, he said, Drake traveled to visit family and bring his grandson a toy for his birthday. That’s the kind of person he was, Trujillo said. “He tried. When the chips were down, he still tried. It might not be a diamond ring or a Game Boy, but it meant a lot,” he said. Before the church closed in 2011, Drake attended St. Mary’s Episcopal Church at the corner of 5th Street and Imperial Beach Boulevard, Bain-Trujillo said. Drake was cremated in San Diego after the fire. A funeral service will be held at 2 p.m. April 13 at The Rock Church at 2345 South Waterman Avenue in San Bernardino. He is survived by his sister Eleanor Drake, brother Tom Drake; his five children Angela Bain­ Trujillo, Julie Bain, Daniel Drake, Steven Drake and Rachel Drake; and 10 grandchildren. This entry was posted on Sunday, June 22nd, 2014 at 9:59 pm. It is filed under Story Archive and tagged with fire, Imperial Beach Patch, obituary. You can follow any responses to this entry through the RSS 2.0 feed.